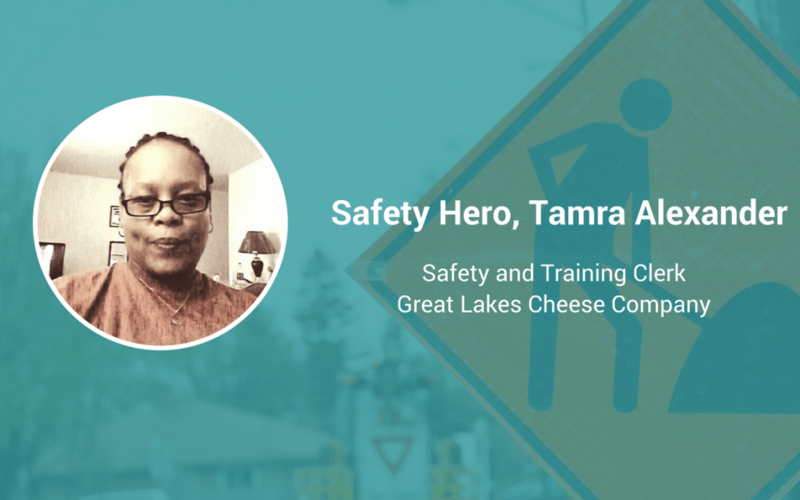 Tamra Alexander, Safety and Training Clerk for Great Lakes Cheese, embodies a safety leader who is dedicated to empowering workers so that they can be as safe as possible each day. Great Lakes Cheese is the largest private-label cheese packager in the United States, and it is marketed under some of the world’s most recognized store brands. As a family- and employee-owned company, Great Lakes Cheese is committed to quality. Alexander has that same commitment—and, she has just as strong of a commitment to supporting the health and safety of workers at Great Lakes Cheese. Keep reading to learn how she ended up in her current role, and why her superpower is sincerity. I came to the company with prior experience with safety. This company had no prior safety roles, with the exception of managers or above. The company decided to start a safety team and I was nominated safety team captain. It started from there. What is important to be effective in your role? To be effective, I believe one must communicate the objective clearly, and to have people around who are buying in. I am almost there! Yes. When a forklift hit an employee in the warehouse. It was scary. I started a campaign to communicate on the floor and in the warehouse. I just want them to know that safety is important in every aspect of your life. [What] you take for granted now will affect you later. Sincerity. I believe people want their safety issues addressed and I will do everything in my power to take care of a problem. More importantly, they believe me!